Appearance:Aster is 2.0 m.(6.5 ft)long. 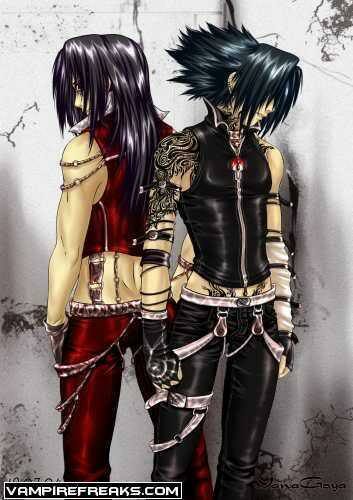 Aster doesn't have tattoo's like his brother. Aster has piercings. He has a snake bite, a neck piercing, and a anti-tragus. Aster has charcoal black eyes. A lot of people find it scary, but he just laughs at them. Personality:Aster is the more logical thinking person of the two. Aster always thinks logic and tries to keep his head cool. If he is bored, Jack always knows something to do, since Jack is the more outgoing person. Jack will do anything for his brother, 'cause he is the only family he has left. He and his brother bearly ever left eachother after their sisters passed away. If Jack ever needs help, Aster is his man. Aster always had higher grades with classes you needed to study for, but Jack always had higher grades for classes you needed to use your hands for. Aster will also always find comfort at his pokemon, Nidoran. Eversince Aster met her there was a connection, he doesn't know exactly why. History:After Aster and Jack and their sisters were taken away from the scene they were taken care of by a police officer. They went to her house, staying the night. She took care of all four of them until she would find the appropriate foster care. After the huge shock and the depressing Jack and Aster reached the age of 16. His sisters were now 6 years old. One day they didn't feel to well, both of them. So they brought them to the hospital. Jack and Aster wanted to do everything they could do to help. But it was already to late. After a lot of treatments, there was nothing they could do. They passed away. Aster cried for days. Jack didn't. Jack was mad, not sure about what, he just was. He punched a large window in the hospital, making it break, leaving nasty cuts on his arm. One of them became a scar witch now hides underneath Jacks glove. After they got over their death, they were at the age of 19. They then both met a male and female Nidoran. It didn't take long before they befriended them. They decided to go on a journey with their Pokemon, trying to get their lives in gear again. Terica is always trying to cheer Aster up whenever he is down. She and Scai are always playing when able, trying to always have fun while they can. They are trying to set an example to Jack and Aster to try and always have fun, no matter how hard life is. Could be a bit difficult playing two characters at once, but it could be done. Maybe you should have 2 more paragraphs worth of personality since you're playing two different people XD Still, approved.